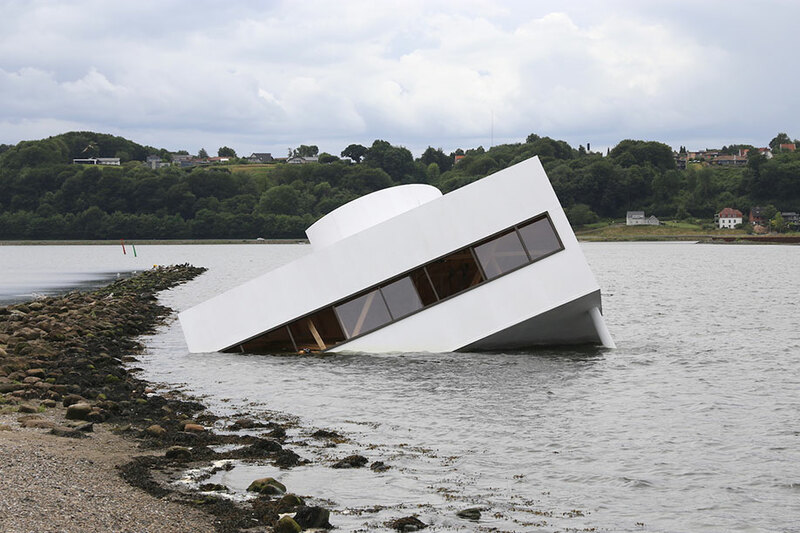 Danish artist Asmund Havsteen-Mikkelsen’s installation Flooded Modernity is floating in the waters of Vejle, Denmark, until September 2nd. Buildings, the land-based creations they are, don’t usually perish in watery graves. However, that hasn’t stopped artists and architects from sending iconic structures to Davy Jones’s locker. In his famous 1978 photomontage, The Titanic, Chicago architect Stanley Tigerman torpedoed Mies van der Rohe’s glass-and-steel Crown Hall into Lake Michigan. By sending the building to bottom of the lake, Tigerman took a sharp (if playful) jab at Mies’s laconic school of Modernism. Now, Danish artist Asmund Havsteen-Mikkelsen has sunk another Modernist architectural icon: Le Corbusier’s 1929 Villa Savoye. The artwork, dubbed Flooded Modernity, is one of ten waterborne installations selected by the Danish art museum VejleMuseerne for its Floating Art 2018 festival. Built over the course of eight days by the artist and assistants, the crisp black-and-white model is 49 feet long, 33 feet wide, and 20 feet deep. The wood, polystyrene, and Plexiglas construction weighs some 11,000 pounds, but floats easily—it’s already been towed to several locations in and around Vejle’s fjord. It seems that architecture, so long as it possesses symbolic value, will always be caught in art’s cross-hairs. In 2015, Tigerman issued an updated version of his 1978 photomontage, this time depicting a massive bomb falling upon Frank Gehry’s Bilbao Guggenheim Museum and Crown Hall. Whether it’s by air or sea, no icon is safe.